The feasibility of using biochar as a sorbent to remove nine halogenated phenols (2,4-dichlorophenol, 2,4-dibromophenol, 2,4-difluorophenol, 2-chlorophenol, 4-chlorophenol, 2-bromophenol, 4-bromophenol, 2-fluorophenol, and 4-fluorophenol) and two pharmaceuticals (triclosan and ibuprofen) from water was examined through a series of batch experiments. 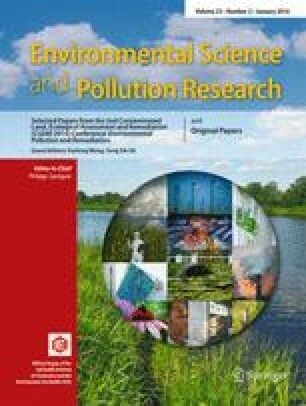 Types of biochar, synthesized using various biomasses including fallen leaves, rice straw, corn stalk, used coffee grounds, and biosolids, were evaluated. Compared to granular activated carbon (GAC), most of the biochar samples did not effectively remove halogenated phenols or pharmaceuticals from water. The increase in pH and deprotonation of phenols in biochar systems may be responsible for its ineffectiveness at this task. When pH was maintained at 4 or 7, the sorption capacity of biochar was markedly increased. Considering maximum sorption capacity and properties of sorbents and sorbates, it appears that the sorption capacity of biochar for halogenated phenols is related to the surface area and carbon content of the biochar and the hydrophobicity of halogenated phenols. In the cases of triclosan and ibuprofen, the sorptive capacities of GAC, graphite, and biochars were also significantly affected by pH, according to the point of zero charge (PZC) of sorbents and deprotonation of the pharmaceuticals. Pyrolysis temperature did not affect the sorption capacity of halogenated phenols or pharmaceuticals. Based on the experimental observations, some biochars are good candidates for removal of halogenated phenols, triclosan, and ibuprofen from water and soil. The online version of this article (doi: 10.1007/s11356-015-4201-8) contains supplementary material, which is available to authorized users. This research was supported by the Basic Science Research Program through the National Research Foundation of Korea (NRF) funded by the Ministry of Education (2013007767).